(Nanowerk News) Films of FePt nanocubes begin to overcome several of the obstacles associated with the development of magnetic data storage media based on self-oriented magnetic arrays of FePt nanoparticles. Chemically synthesized FePt nanoparticles have potential for application as magnetic media for data storage. In order to be used as data storage media, however, they must be deposited on substrates in such a way that their magnetic axes are aligned with respect to one another and with respect to the substrate, a problem that has yet to be overcome with spherical FePt nanoparticles. Researchers at Seagate Research and the Department of Materials Science and Engineering at Carnegie Mellon University now have successfully synthesized single crystalline FePt nanoparticles with cubic shapes. Their findings will be reported in an article titled "Oriented self-assembly of cubic FePt nanoparticles" in the April 2006 edition of Materials Letter. "The synthesis and oriented self-assembly of cubic FePt nanoparticles takes us several steps forward towards the ultimate development of magnetic recording media based on monodisperse FePt nanoparticles in the magnetic L10 phase" Nisha Shukla, one of the researchers, told Nanowerk. "Nanoparticles have now been synthesized in a cubic rather than spherical shape. This allows closer packing of particles into self-assembled two dimensional arrays." "More importantly" Shukla adds, "these deposit on a substrate with crystallographic axes that are oriented with respect to the surface normal. More surprisingly, they assemble with axes that are oriented in the plane with respect to one another. This orientation of nanoparticles has not been achieved before and has always been a challenge for particulate based recording media." Synthesis and self-assembly of FePt nanoparticles have been of great interest to the data storage industry as a possible means for making nanoparticle based magnetic media which can enable recording densities as high as 1 Tbit/in.2. The magnetic bits which record data in thin film magnetic media are comprised of many grains. In order to achieve high recording densities with bits having well defined shapes and boundaries it is necessary to decrease the size of the grains such that they remain significantly smaller than the bit size. If the grains become too small, however, one reaches the superparamagnetic limit in which the magnetic moment of the individual bits becomes thermally unstable. Self-assembled arrays of nanoparticles can, in principle, reduce transition jitter by having uniformly sized magnetic grains separated by a well-defined center-to-center grain distance. Jitter is the noise in the magnetic signal from the media that arises from the poorly defined boundary of the magnetic bit formed by randomly shaped and randomly sized magnetic grains. 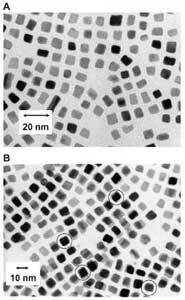 Thus the ideal magnetic media would be formed of nanoparticles which are of uniform, small size and packed into arrays with the highest possible density.